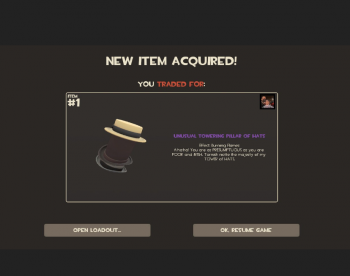 The service built to supply Team Fortress 2 with hats now lays claim to 55 million downloads one year on. It wouldn't be entirely fair to Valve to call Steam's Workshop an accidental success, but it's hard to believe Valve realized what it was getting into when it created a service to facilitate fan-made mods for Team Fortress 2. After one year, the Workshop now lays claim to 55 million downloads; Valve says it is the most visited area of the Steam community. "Workshop contributors for Team Fortress 2 and Defense of the Ancients 2 combined have been paid millions of dollars for the items they've created now on sale," said a Valve spokesman in a blog post celebrating the Shop's birthday. The heavy hitters like Civilization V and Skyrim - both of which have published mods and add-ons - are the most visible, but there are sixteen shipped titles on the Workshop so far, with more to come. "Valve has always been committed to supporting the modding community," said the official blog post, "and many of us got our starts in this industry as modders." Valve wants to make sure that its kindred spirits get the tools they need to make gaming magic happen. Though Valve let nothing substantial slip, "important additions" are promised in the very near future, to help its community.